"Prius" redirects here. For the video game, see Prius Online. The Toyota Prius (/ˈpriːəs/; Japanese:トヨタ プリウス Toyota Puriusu) is a full hybrid electric automobile developed by Toyota and manufactured by the company since 1997. Initially offered as a 4-door sedan, it has been produced only as a 5-door liftback since 2003. The United States Environmental Protection Agency (EPA) and California Air Resources Board (CARB) rate the Prius as among the cleanest vehicles sold in the United States, based on smog-forming emissions. The 2018 model year Prius Eco ranks as the second most fuel efficient gasoline-powered car available in the US without plug-in capability, following the Hyundai Ioniq "Blue". The Prius first went on sale in Japan and other countries in 1997, and was available at all four Toyota Japan dealership chains, making it the first mass-produced hybrid vehicle. It was subsequently introduced worldwide in 2000. The Prius is sold in over 90 markets, with Japan and the United States being its largest markets. Global cumulative Prius liftback sales reached the milestone 1 million vehicle mark in May 2008, 2 million in September 2010, and passed the 3 million mark in June 2013. Cumulative sales of one million were achieved in the U.S. by early April 2011, and Japan reached the 1 million mark in August 2011. As of January 2017[update], the Prius liftback is the world's top selling hybrid car with almost 4 million units sold. In 2011, Toyota expanded the Prius family to include the Prius v, an extended hatchback, and the Prius c, a subcompact hatchback. The production version of the Prius plug-in hybrid was released in 2012. The second generation of the plug-in variant, the Prius Prime, was released in the U.S. in November 2016. The Prime achieved the highest miles per gallon equivalent (MPGe) rating in all-electric mode of any vehicle rated by EPA with an internal combustion engine. Global sales of the Prius c variant passed the one million mark during the first half of 2015. The Prius family totaled global cumulative sales of 6.1 million units in January 2017, representing 61% of the 10 million hybrids sold worldwide by Toyota since 1997. Prius is a Latin word meaning "first", "original", "superior" or "to go before". In February 2011, Toyota USA asked the US public to decide on what the most proper plural form of Prius should be, with choices including Prien, Prii, Prium, Prius, or Priuses. The company announced on 20 February that "Prii" was the most popular choice, and the new official plural designation in the US. In Latin prius is the neuter singular of the comparative form (prior, prior, prius) of an adjective with only comparative and superlative (the superlative being primus, prima, primum). As with all neuter words, the Latin plural is priora, but that brand name was used by the Lada Priora in 2007. Despite the "official" plural form used by Toyota USA, "Priuses" is widely used in English. Beginning in September 2011, Toyota USA began using the following names to differentiate the original Prius from some newer members of the Prius family: the standard Prius became the Prius Liftback, the Prius v (known as the Prius α in Japan, and Prius + in Europe), the Prius Plug-in Hybrid, and the Prius c (called Toyota Aqua in Japan). In 1995, Toyota debuted a hybrid concept car at the Tokyo Motor Show, with testing following a year later. The first Prius, model NHW10, went on sale on 10 December 1997. The first generation Prius (NHW10) was available only in Japan, though it has been imported privately to at least the United States, United Kingdom, Australia,[not in citation given][dubious – discuss] and New Zealand. The first generation Prius, at its launch, became the world's first mass-produced gasoline-electric hybrid car. At its introduction in 1997, it won the Car of the Year Japan Award, and in 1998, it won the Automotive Researchers' and Journalists' Conference Car of the Year award in Japan. Production commenced in December 1997 at the Takaoka plant in Toyota, Aichi, ending in February 2000 after cumulative production of 37,425 vehicles. The NHW10 Prius styling originated from California designers, who were selected over competing designs from other Toyota design studios. The Prius NHW11 (sometimes referred to as "Generation II") was the first Prius sold by Toyota outside of Japan, with sales in limited numbers beginning in the year 2000 in Asia, America, Europe and Australia. In the United States, the Prius was marketed between the smaller Corolla and the larger Camry. The published retail price of the car was US$19,995. European sales began in September 2000. The official launch of the Prius in Australia occurred at the October 2001 Sydney Motor Show, although sales were slow until the NHW20 (XW20) model arrived. Toyota sold about 123,000 first generation Priuses. Production of the NHW11 model commenced in May 2000 at the Motomachi plant in the same area, and continued until XW10 manufacture ended in June 2003 after 33,411 NHW11 vehicles had been produced. The vehicle was the second mass-produced hybrid on the American market, after the two-seat Honda Insight. The NHW11 Prius became more powerful partly to satisfy the higher speeds and longer distances that Americans drive. Air conditioning and electric power steering were standard equipment. While the larger Prius could seat five, its battery pack restricted cargo space. The Prius was offered in US in three trim packages: Standard, Base and Touring. The US EPA (CARB) classified the car with an air pollution score of 3 out of 10 as an Ultra Low Emission Vehicle (ULEV). Prius owners were eligible for up to a US$2,000 federal tax deduction from their gross income. Toyota executives stated that with the Prius NHW10 model, the company had been losing money on each Prius sold, and with the NHW11 it was now breaking even. Presented at the April 2003 New York International Auto Show, for the 2004 US model year, the NHW20 Prius was a complete redesign. It became a compact liftback, sized between the Corolla and the Camry, with redistributed mechanical and interior space significantly increasing rear-seat legroom and luggage room. The second generation Prius is more environmentally friendly than the previous model (according to the EPA), and is 6 inches (150 mm) longer than the previous version. Its more aerodynamic Kammback body balances length and wind resistance, resulting in a drag coefficient of Cd=0.26. The development effort, led by chief engineer Shigeyuki Hori, led to 530 patents for the vehicle. Production commenced in August 2003 at the Tsutsumi plant in Toyota, Aichi, supplemented in October 2004 with the Fujimatsu plant at Kariya, Aichi. The Prius uses an all-electric A/C compressor for cooling, an industry first. Combined with a smaller and lighter NiMH battery, the XW20 is more powerful and more efficient than the XW10. In the US, the battery pack of 2004 and later models is warranted for 150,000 miles (240,000 km) or 10 years in states that have adopted the stricter California emissions control standards, and 100,000 miles (160,000 km) or 8 years elsewhere. The warranty for hybrid components is 100,000 miles (160,000 km) or 8 years. It is classified as a SULEV (Super Ultra Low Emissions Vehicle) and is certified by California Air Resources Board as an "Advanced Technology Partial Zero Emission Vehicle" (AT-PZEV). From 2005 to 2009, the second generation Prius had been built by FAW-Toyota in the city of Changchun for the Chinese market. It was reported that a total of 2,152 Priuses were sold in 2006 and 414 in 2007. The relatively low sales was blamed on high price, about US$15,000 higher than the equivalent in Japan or the US, caused by high duties on imported parts. In early March 2008, Toyota cut the price of Prius by up to eight percent or US$3,000 to CN¥259,800 (US$36,500). It was thought that the sales dropped as a result of both a lack of acceptance and increased competition. The Toyota Prius Hybrid was exported to China from 2007. Toyota sold about 1,192,000-second generation Priuses worldwide. Toyota debuted the new Prius (2010 US model year) at the January 2009 North American International Auto Show, and sales began in Japan on May 18, 2009. Toyota cut the price of the Prius from ¥2.331 million to ¥2.05 million to better compete with the Honda Insight, leading some to wonder whether increased sales of the Prius might come at the expense of sales of other vehicles with higher margins. Competition from lower priced hybrids, such as the Honda Insight, also made it difficult for Toyota to capitalize on the Prius's success. As of June 2013[update], Toyota has sold about 1,688,000 third-generation Priuses worldwide. Among the new standard features of the Prius, Toyota introduced three optional user-selectable driving modes: EV mode for electric-only low-speed operation, Eco mode for best fuel efficiency, and Power mode for better performance. Optional features included the solar-PV roof panels to help cool the cabin interior in summer heat, Intelligent Parking Assist and Dynamic Radar Cruise Control. Its new body design is more aerodynamic, with a reduced drag coefficient of Cd=0.25. This figure is disputed by General Motors which found the value for the model with 17-inch wheels to be around 0.30 based on tests in GM, Ford, and Chrysler wind tunnels. Car & Driver measured the third generation Prius at 0.26 in a privately arranged five-way wind-tunnel test of comparable cars. An underbody rear fin helps stabilize the vehicle at higher speeds. A new front-drive platform underpinned the car, although the wheelbase remained unchanged and overall length grew by a lone centimetre. Weight-saving aluminum was employed in the hood, rear hatch, front axle and brake calipers (disc brakes were finally assigned to all four wheels). In constructing the Prius, Toyota used a new range of plant-derived ecological bioplastics, made out of cellulose derived from wood or grass instead of petroleum. The two principal crops used are kenaf and ramie. Kenaf is a member of the hibiscus family, a relative to cotton and okra; ramie, commonly known as China grass, is a member of the nettle family and one of the strongest natural fibres, with a density and absorbency comparable to flax. Toyota says this is a particularly timely breakthrough for plant-based eco-plastics because 2009 is the United Nations' International Year of Natural Fibres, which spotlights kenaf and ramie among others. At its introduction in 2009, it won the Car of the Year Japan Award for the second time. In December 2013, Consumer Reports named the Prius as the "Best Value", for the second year in a row. The fourth generation Prius was first shown during September 2015 in Las Vegas, and was released for retail customers in Japan on December 9, 2015. The launch in North American market occurred in January 2016, and February in Europe. In August 2013, Toyota Managing Officer Satoshi Ogiso, who was chief engineer for the Prius line, announced some of the improvements and key features of the next generation Prius. This was the first generation of the Prius to use the Toyota New Global Architecture (TNGA) modular platform, which provides a lower center of gravity and increased structural rigidity. Ogiso also explained that the next-generation Prius plug-in hybrid, the Prius Prime, was developed in parallel with the standard Prius model. In late November 2018, for the 2019 model year, the U.S. market Prius lineup introduced an all-wheel drive model featuring Toyota's E-Four system. This has been available for the Japanese market Prius since 2015 and the hybrid versions of the RAV4 and Lexus NX. Also, the Prius received a facelift with redesigned headlights and taillights, which was released in Japan on December 17, 2018. The Prius Plug-in Hybrid (ZVW35) is based on the conventional third generation (ZVW30) with a 4.4-kWh lithium-ion battery that allows an all-electric range of 23 km (14.3 mi). A global demonstration program involving 600 pre-production test cars began in late 2009 and took place in Japan, Europe, Canada, China, Australia, New Zealand and the United States. The production version was unveiled at the September 2011 Frankfurt Motor Show. Deliveries began in Japan in late January 2012, followed by a limited roll-out in the U.S. in late February. Deliveries began in Europe in June 2012 and in the UK in August 2012. During its first year in the market, global sales reached 27,181 Prius PHVs, making the Prius PHV the second top selling plug-in electric car in 2012 after the Chevrolet Volt. Production of the first generation Prius Plug-in hybrid ended in June 2015. As of April 2016[update], cumulative sales of the first generation Prius PHVs totaled 75,400 units delivered worldwide since 2012. The United States led sales with 42,345 units delivered through September 2016, followed by Japan with 22,100 units, and Europe with 10,600 units, both through January 2017. By the end of 2016, the Prius plug-in ranked as the world's all-time third top selling plug-in hybrid after the Volt/Ampera family of vehicles, and the Mitsubishi Outlander P-HEV. The second generation Prius plug-in, called Toyota Prius Prime in the U.S. and Prius PHV in Japan, was developed in parallel with the standard fourth generation Prius model (XW50) released in December 2015. The model was released to retail customers in the U.S. in November 2016, followed by Japan in February 2017. In the American market, unlike the first generation model, the Prius Prime will be available in all 50 states. Cumulative global sales of both Prius plug-in generations totaled 79,300 units at the end of January 2017. The U.S. is the top selling market, with 46,133 units sold since inception through January 2017, of which, 3,788 units are second generation Prius Prime cars. The Prime has an EPA-rated all-electric range of 25 mi (40 km), over twice the range of the first generation model, and an EPA rated fuel economy of 133 mpg‑e (25.9 kW⋅h/100 mi) in all-electric mode (EV mode), the highest MPGe rating in EV mode of any vehicle rated by EPA with an internal combustion engine. Among all-electric cars, only the Hyundai Ioniq Electric has a higher energy efficiency, rated at 136 mpg‑e (25.3 kW⋅h/100 mi; 15.7 kW⋅h/100 km). Unlike its predecessor, the Prime runs entirely on electricity in charge-depleting mode (EV mode). Toyota targeted the fuel economy in hybrid mode to be equal or better than regular fourth generation Prius liftback. The Prius Prime has an EPA-rated combined fuel economy in hybrid mode of 54 mpg‑US (4.4 L/100 km; 65 mpg‑imp), 55 mpg‑US (4.3 L/100 km; 66 mpg‑imp) in city driving, and 53 mpg‑US (4.4 L/100 km; 64 mpg‑imp) in highway. Only the Prius Eco has a higher EPA-rated fuel economy rating in hybrid mode. The 2017 model year Prime has a different exterior design than the fourth generation Prius. The interior design is also different. The Prime has a four-seat cabin layout, as Toyota decided to improve the car's efficiency to achieve its design goals. In May 2011 Toyota introduced the Prius α (alpha) in Japan, which is available in a five-seat, two-row model and a seven-seat, three-row model, the latter's third row enabled by a space-saving lithium-ion drive battery in the center console. The five-seat model uses a NiMH battery pack. The Alpha is the basis for the five-seat Prius v launched in North America in October 2011 with a nickel-metal hydride battery pack similar to the 2010 model year Prius, and with two rows of seats to accommodate five passengers. The European and Japanese versions are offered with a lithium-ion battery, with three rows of seats with accommodations for seven passengers. However, the seven passenger seating on the Prius v is not available on North American Prius v models. The European version, named Prius+ (plus), began deliveries in June 2012. Global sales totaled 671,200 units as of January 2017[update]. Japan is the leading market with 446,400 units sold, followed by North America with 173,100 units, and Europe with 43,800, all through January 2017. Toyota unveiled the Prius c concept at the January 2011 North American International Auto Show. The Prius c has a lower list price and is smaller than the previous Prius hatchback. The production version was unveiled at the 2011 Tokyo Motor Show as the Toyota Aqua, and was launched in Japan in December 2011. The Prius c was released in the US and Canada in March 2012, and in April 2012 in Australia and New Zealand. The Prius c is not available in Europe, where instead, Toyota is selling the Toyota Yaris Hybrid since June 2012. The Prius c and the Yaris Hybrid share the same powertrain. The Aqua ranked as the second best selling car in Japan in 2012 after the Prius brand, as Toyota reports together sales of the conventional Prius and the Prius α. When sales of these two Prius models are broken down, the Toyota Aqua ranked as the top selling model in Japan, including kei cars, with the Aqua leading monthly sales since February through December 2012. Thereafter, the Aqua has been the top selling new car in Japan for three years running, from 2013 to 2015, and it is considered the most successful nameplate launch in Japan in the last 20 years. Global sales of the Aqua/Prius c passed the 500,000 mark in August 2013. and the 1 million milestone during the first half of 2015. As of January 2017[update], with 1,380,100 units sold worldwide, the Aqua/Prius c is the second top selling TMC hybrid after the regular Prius. The top market is Japan with 1,154,500 Aquas sold, capturing 83.6% of global sales, followed by North America with 192,700 units. As of January 2017[update], the Prius is sold in over 90 countries and regions. Worldwide cumulative sales of the Prius passed the 1 million mark in May 2008, exceeded 2 million units in September 2010, and reached the 3 million milestone in June 2013. As of January 2017[update], global sales of the Prius family totaled almost 6.115 million units representing 61% of the 10 million hybrids delivered by Toyota Motor Company (TMC) worldwide, including the Lexus brand. Sales of the Prius family are led by the Prius liftback with 3.985 million units, followed by the Aqua/Prius c with 1.38 million, the Prius +/v/α with, 614.7 thousand and the Prius Plug-in Hybrid with 79.3 thousand units. As of April 2011[update], the US accounted for almost half of Prius liftback global sales, with 1 million Priuses sold since 2000. However, the Prius experienced two consecutive years of sales decreases from its peak in 2007, falling to 139,682 units in 2009 before rebounding to 140,928 units in 2010. Sales in Japan reached 1 million Priuses in August 2011. As of January 2017[update], sales of the Prius liftback totaled over 1.8 million units in Japan and 1.75 million in the United States, and ranked as the all-time best-selling hybrid car in both countries. Cumulative Prius sales in Europe reach 100,000 in 2008 and 200,000 units by mid-2010, after 10 years on that market. The UK is one of the leading European markets for Prius, accounting more than 20 percent of all Priuses sold in Europe. Toyota Prius became Japan's best selling vehicle in 2009 for the first time since its debut in 1997 as its sales almost tripled to 208,876 in 2009. In that year it overtook the Honda Fit, which was Japan's best-selling car in 2008 excluding Kei cars. Rising oil prices caused by the Arab Spring led to increased sales of the Prius in the first quarter of 2011, but the 2011 Tōhoku earthquake and tsunami led to a production stoppage. Production restarted several days later, but output was hindered due to shortages from parts suppliers. Nevertheless, during the 2011 Japanese fiscal year (1 April 2011 through 31 March 2012), the Prius family sold 310,484 units, including sales of the Prius α, launched in May 2011, and the Toyota Aqua, launched in December, allowing the Prius brand to become the best-selling vehicle in Japan for the third-consecutive year. Until September 2012, The Prius liftback was the top selling new car in Japan for 16 months in a row, until it was surpassed by the Toyota Aqua in October, which kept the lead through December 2012. The Prius liftback, with 317,675 units sold in 2012 (including sales of the Prius α), was the best selling car in Japan during the 2012 calendar year for the fourth consecutive year. The Aqua ranked as the second best selling car with 266,567 units sold in 2012. Nevertheless, when sales of the two Prius models are broken down, the Toyota Aqua ranked as the top selling model in Japan in 2012, including kei cars, leading sales since February through December 2012. The Aqua was the top selling new car in Japan in 2013, and again in 2014. Global Prius sales peaked in 2010 with over 500 thousand units sold, and since 2011 sales of the liftback version have declined in most markets through December 2015, and in the US and Canada since 2013. High gasoline prices in the US, approaching US$4 a gallon by March 2012, contributed to record monthly sales of the Prius family vehicles. A total of 28,711 units were sold in the United States during March 2012, becoming the one-month record for Prius sales ever. The third-generation Prius liftback accounted for 18,008 units (62.7%); the Prius v accounted for 4,937 units (17.2%); the Prius c, for 4,875 units (17.0%); and the Prius Plug-in Hybrid, for 891 units (3.1%). Another record was set during the first-quarter of 2012, with Prius family sales of 60,859 units, it became the best selling quarter ever. Sales of Toyota Prius family vehicles in California represented 26% of all Prius purchases in the US during 2012. With 60,688 units sold during this year, the Prius became the best selling vehicle in California, ahead of the previous leader, the Honda Civic (57,124 units) and the third ranked, the Toyota Camry (50,250 units). The Prius nameplate was again in 2013 the best selling vehicle in California with 69,728 units sold in the state, ahead of the Honda Civic (66,982) and the Honda Accord (63,194). Toyota sold 223,905 Priuses among the various HEV family members in the US in 2012, representing together a market share of 51.5% of all hybrid sold in the country that year. In addition, a total of 12,750 Prius PHVs were sold in 2012, allowing the plug-in hybrid to rank as the second top selling plug-in electric car in the US after the Chevrolet Volt, and surpassing the Nissan Leaf. The Toyota Prius liftback, with 147,503 units sold, was the best selling hybrid in 2012, the Prius v ranked third with 40,669 units, and the Prius c was fourth with 35,733 units. Toyota USA estimated that sales of its hybrids models in 2012 would represent 14% of total Toyota sales in the country. Since their inception in 1999, a total of 1.5 million Prius family members have been sold in the US by mid October 2013, representing a 50.1% market share of total hybrid sales in the country. Of these, 1,356,318 are conventional Prius liftbacks sold through September 2013. Prius family sales also set a record in Japan in March 2012. Accounting for the conventional Prius and Prius α sales, a total of 45,496 units were sold in March 2012, becoming the highest monthly sales ever for any model in Japan since 1997, and representing a market share of 9% of all new car registrations excluding kei cars. The Toyota Aqua sold 29,156 units, ranking as the third top selling car that month. Together, all Prius family vehicles sold 74,652 units, representing 15% of monthly new car sales in March 2012. With a total of 247,230 vehicles sold during the first quarter of 2012, the Toyota Prius family became the third top selling nameplate in the world in terms of total global sales, after the Toyota Corolla (300,800 units) and the Ford Focus (277,000 units). US Prius sales have declined every year since their peak in 2012. The following table presents retail sales of the other vehicles of the Prius family by year since deliveries began in 2011 through December 2016. Notes: (1) Global cumulative sales for the Prius nameplate, when the Prius liftback is included, adds up to 6.115 million units through December 2016. (2) Not available in Europe, instead, Toyota is selling the Toyota Yaris Hybrid which shares the same powertrain as the Prius c.
A total of 302,700 Yaris Hybrids have been sold through December 2016. The Prius is a power-split or series-parallel (full) hybrid, sometimes referred to as a combined hybrid, a vehicle that can be propelled by gasoline or electric power or both. Wind resistance is reduced by a drag coefficient of Cd=0.25 (0.29 for 2000 model) with a Kammback design to reduce air resistance. Lower rolling-resistance tires are used to reduce road friction. An electric water pump eliminates serpentine belts. In the US and Canada, a vacuum flask is used to store hot coolant when the vehicle is powered off for reuse so as to reduce warm-up time. The Prius engine makes use of the Atkinson cycle. When the vehicle is turned on with the "Power" button, it is ready to drive immediately with the electric motor. In the second generation Prius, electric pumps warm the engine by pumping previously saved hot engine coolant from a coolant thermos before the internal combustion engine is started. The delay between powering the car on and starting the internal combustion engine is a few seconds. The third generation Prius does not have a coolant thermos. Instead, the engine is heated by recapturing exhaust heat. A button labelled "EV" maintains Electric Vehicle mode after being powered on and under most low-load conditions at less than 25 mph (40 km/h). This permits driving with low noise and no fuel consumption for journeys under 0.5 miles (0.80 km). Prior to the 2010 model, the North American model did not have the "EV" button, although one can be added to enable the "EV" mode supported internally by the Prius Hybrid Vehicle management computer. For the N.American market, the third generation can remain in EV mode until 70 km/h (43 mph) depending on throttle and road gradient. There are two principal battery packs, the High Voltage (HV) battery, also known as the traction battery, and a 12 volt battery known as the Low Voltage (LV) battery. The traction battery of the first generation Prius update (2000 onwards) was a sealed 38-module nickel metal hydride (NiMH) battery pack providing 273.6 volt, 6.5 Ah capacity and weighing 53.3 kg (118 lb) and is supplied by Japan's Panasonic EV Energy Co. They are normally charged between 40–60% of maximum capacity to prolong battery life as well as allow headroom for regenerative braking. Each battery pack uses 10–15 kg (22–33 lb) of lanthanum, and each Prius electric motor contains 1 kg (2 lb) of neodymium; production of the car is described as "the biggest user of rare earths of any object in the world." The LV battery is essential to starting the car and providing initial power to the computer. The Second Generation Prius contains a 1.310 kWh battery, composed of 28 modules. Each battery module is made of 6 individual 1.2 V 6.5 Ah Prismatic NiMH cells in series forming a 7.2 V 6.5 Ah module with 46 Wh/kg energy density and 1.3 kW/kg output power density. Each module contains an integrated charge controller and relay. These modules are connected 28 in series to form a 201.6 V 6.5 Ah battery (traction battery), also known as the energy storage system. The computer controlled charge controller and battery management computer systems keep this battery between 38% and 82% state of charge, with a tendency to keep the average state of charge around 60%. By shallow cycling the battery only a small portion of its net available energy storage capacity is available for use (approximately 400 Wh) by the hybrid drive system, but the shallow computer controlled cycling dramatically improves the cycle life, thermal management control, and net long term calendar life of the battery. Active cooling of this battery is achieved by a blower motor and air ducting, while passive thermal management was accomplished through the metal case design. As the Prius reached ten years of being available in the US market, in February 2011 Consumer Reports examined the lifetime and replacement cost of the Prius battery. The magazine tested a 2002 Toyota Prius with over 200,000 miles on it, and compared the results to the nearly identical 2001 Prius with 2,000 miles tested by Consumer Reports 10 years before. The comparison showed little difference in performance when tested for fuel economy and acceleration. Overall fuel economy of the 2001 model was 40.6 miles per US gallon (5.79 L/100 km; 48.8 mpg‑imp) while the 2002 Prius with high mileage delivered 40.4 miles per US gallon (5.82 L/100 km; 48.5 mpg‑imp). The magazine concluded that the effectiveness of the battery has not degraded over the long run. The cost of replacing the first generation battery varies between US$2,200 and US$2,600 from a Toyota dealer, but low-use units from salvage yards are available for around US$500. One study indicates it may be worthwhile to rebuild batteries using good blades from defective used batteries. The HVAC system uses an AC induction motor to drive a sealed-system scroll compressor, a design principle not usually used in automotive applications. Using a scroll compressor increases the efficiency of the system, while driving it with an AC induction motor makes the system more flexible, so the AC can run while the engine is off. Because the oil used with the refrigerant gas also flows in the area of the high-voltage motor-windings, the fluid must be electrically insulating to avoid transmitting electric current to exposed metal parts of the system. Therefore, Toyota specifies a polyolester (POE) oil (designated ND11) is required for repairs. The system cannot be serviced with equipment normally employed for regular cars, which typically use polyalkylene glycol (PAG) oil, as the equipment would contaminate the ND11 oil with PAG oil. According to SAE J2843 the oil provided from maintenance equipment must contain less than 0.1% PAG when filling. One percent PAG oil may result in an electrical resistance drop by a factor of about 10. Since its inception, the Toyota Prius has been among the best fuel economy vehicles available in the United States, and for the model year 2012, the Prius family has three models among the 10 most fuel-efficient cars sold in the country as rated by US Environmental Protection Agency (EPA). After the Honda Insight first generation was discontinued in September 2006, the Prius liftback became the most fuel-efficient car sold in the American market, until it was topped by the Chevrolet Volt in December 2010, as the plug-in hybrid was rated by EPA with an overall combined city/highway gasoline-electricity fuel economy of 60 mpg‑US (3.9 L/100 km; 72 mpg‑imp) equivalent (MPG-e). According to the EPA, for the model year 2012, and when only gasoline-powered vehicles are considered (excluding all-electric cars), the Prius c ranks as the most fuel-efficient compact car, the Prius liftback as the most fuel-efficient midsize car, and the Prius v as the most fuel-efficient midsize station wagon. More fossil fuel is needed to build hybrid vehicles than conventional cars but reduced emissions when running the vehicle more than outweigh this. Source: US Department of Energy and US Environmental Protection Agency All ratings correspond to EPA 5-cycle testing procedure (2008 and beyond). Note: (1) First score is for California and Northeastern states, the second score is for the other states and D.C. Super Ultra Low Emission Vehicle (SULEV) is a US classification for conventionally powered vehicles designed to produce minimal emissions of certain categories of air pollution. The following table presents fuel economy performance and carbon emissions for all Prius family models sold in Japan since 1997. The ratings are presented for both, the older official 10-15 mode cycle test and the new JC08 test designed for Japan's new standards that went into effect in 2015, but was already being used by several car manufacturers for new cars. The Prius 2nd generation became the first car to meet Japan's new 2015 Fuel Economy Standards measured under the JC08 test. 2 emissions among its fleet. CNW Marketing Research initially published a study in which they estimated that the total lifetime energy cost of a 2005 Prius was greater than that of a Hummer H2. The study has been widely debunked: see for example, "Hummer versus Prius: 'Dust to Dust' Report Misleads the Media and Public with Bad Science". The Prius uses electric motors in the hybrid propulsion systems, powered by a high voltage battery in the rear of the car. There has been some public concern over whether the levels of electromagnetic field exposure within the cabin are higher than comparable cars, and what health effects those fields may present, popularized by a 2008 The New York Times article. However, Toyota and several independent studies have indicated that aside from a brief spike when accelerating, the electromagnetic fields within the Prius are no different from those of a conventional car and do not exceed the ICNIRP exposure guidelines. A 2013 study by the Mayo Clinic found that patients with implanted cardiac devices such as pacemakers and defibrillators can safely drive or ride in hybrids or plug-in electric cars without risk of electromagnetic interference (EMI). The research was conducted using implantable devices from the three major manufacturers and a 2012 Toyota Prius hybrid. The study used 30 participants with implanted devices, and measured electric and magnetic fields in six positions inside and outside the Prius, and each position was evaluated at different speeds. The Wall Street Journal reported in February 2007 on concerns that quiet cars like the Prius may pose a safety risk to those who rely on engine noise to sense the presence or location of moving vehicles. Blind pedestrians are a primary concern, and the National Federation of the Blind advocates audio emitters on hybrid vehicles, but it has been argued that increased risks may also affect sighted pedestrians or bicyclists who are accustomed to aural cues from vehicles. However, silent vehicles are already relatively common, and there is also a lack of aural cues from vehicles that have a conventional internal combustion engine where engine noise has been reduced by noise-absorbing materials in the engine bay and noise-canceling muffler systems. In July 2007, a spokesman for Toyota said the company is aware of the issue and is studying options. In 2010, Toyota released a device for the third-generation Prius meant to alert pedestrians of its proximity. Japan issued guidelines for such warning devices in January 2010 and the US approved legislation on December 2010. Models equipped with automatically activated systems include all 2012 and later model year Prius family vehicles that have been introduced in the United States, including the standard Prius, the Prius v, the Prius c and the Toyota Prius Plug-in Hybrid. The warning sound is activated when the car is traveling at less than 15 mph (24 km/h) and cannot be manually turned off. 2 less than an equivalent family vehicle with a diesel engine. Average calculated on 20,000 km a year." Points of contention were the vehicles chosen for comparison, whether "'up to' one tonne less" adequately communicated that reductions could be lower, and whether the distance used was appropriate: 20,000 km per year is around a US car's average annual driving distance, while a UK car's is 13,440 km. The large number of Prius-owning progressive celebrities in 2002 prompted The Washington Post to dub hybrids "Hollywood's latest politically correct status symbol". Conservatives called "Prius Patriots" also drive the cars because they want to contribute to reducing US dependence on foreign oil. A 2007 San Francisco Chronicle article said "Prius Progressives" were becoming an archetype, with American conservative commentator Rush Limbaugh opining that "these liberals think they're ahead of the game on these things, and they're just suckers". In July 2007 The New York Times published an article using data from CNW Marketing Research finding that 57% of Prius buyers said their main reason for buying was that "it makes a statement about me", while just 37% cited fuel economy as a prime motivator. Shortly afterwards Washington Post columnist Robert Samuelson coined the term "Prius politics" to describe a situation where the driver's desire to "show off" is a stronger motivator than the desire to curb greenhouse gas emissions. Some conservatives promote use of the Toyota Prius and other hybrid cars. For example, Jim Road from What Would Jesus Drive? encouraged people to drive hybrid cars because of the damage that large SUVs and faster cars can do to others. Former Central Intelligence Agency (CIA) chief R. James Woolsey, Jr. drives a Prius because of its low fuel consumption. Woolsey noted the volatility of the Middle East, coupled with anti-US sentiment in much of the region. Noting that the high percentage of oil drilled in the Middle East gives vast profits to Middle Eastern regimes, Woolsey believes that it is a patriotic obligation to drive more efficient vehicles. In a Motor Trend magazine article, Woolsey stated that those oil profits find their way to terrorist groups like al-Qaeda, meaning that Americans who buy inefficient vehicles would, in effect, be indirectly funding terrorism. "We're paying for both sides in this war, and that's not a good long-term strategy," said Woolsey. "I have a bumper sticker on the back of my Prius that reads, 'Bin Laden hates this car.'" A driverless version of the Prius was one of six cars to finish the 2007 DARPA Urban Challenge. A racing version of the Prius was unveiled by Toyota in 2013. This racing Prius replaces the 1.8-litre Atkinson-cycle engine with a 3.4-litre V8 RV8KLM engine which is mid-mounted in the car. The hybrid drive train of the car's production Hybrid Synergy Drive is retained but with a larger lithium ion battery. The RV8KLM is in fact the same engine featured in multiple Le Mans Prototypes such as the Lola B12/60 and Rebellion R-One. The car took class pole position and finished sixth at the 2012 Fuji GT 500km. There have been a number of governments with incentives intended to encourage hybrid car sales. In some countries, including the US and Canada, some rebate incentives have been exhausted, while other countries such as the United Kingdom, Sweden, Belgium, and the Netherlands have various or alternative incentives to purchasing a hybrid vehicle. Several US companies offer employees incentives. Bank of America will reimburse US$3,000 on the purchase of new hybrid vehicles to full- and part-time associates working more than 20 hours per week. Google, software company Hyperion Solutions, and organic food and drink producer Clif Bar & Co offer employees a US$5,000 credit toward their purchase of certain hybrid vehicles including the Prius. Integrated Archive Systems, a Palo Alto IT company, offers a US$10,000 subsidy toward the purchase of hybrid vehicles to full-time employees employed more than one year. Travelers Companies, a large insurance company, offers hybrid owners a 10% discount on auto insurance in most US states. The Farmers Insurance Group offers a similar discount of up to 10% in most US states. In June 2015, the Prius started use as a general purpose patrol car of the National Police of Ukraine. In return for Ukrainian emissions permits under the Kyoto Protocol, 1,568 cars were supplied by Japan. ^ "2008 Toyota Prius" (Press release). Hybridcar.com. 2007-10-21. Retrieved 2011-11-30. ^ Voelcker, John (2015-12-21). "2016 Toyota Prius: Most Fuel-Efficient Car Without A Plug, Ever". Green Car Reports. Retrieved 2015-12-24. ^ "Fueleconomy.gov Top Ten: Top Fuel Sippers (EPA Ratings, 2018 Model Year)". US Environmental Protection Agency and US Department of Energy. n.d. Archived from the original on 2018-04-09. Retrieved 2018-04-17. ^ "History of the Toyota Prius". UK: Toyota. 2015-02-10. Retrieved 2018-09-28. ^ "Worldwide sales of Toyota Motor hybrids top 4M units; Prius family accounts for almost 72%". Green Car Congress. 2012-05-22. Retrieved 2012-05-22. ^ a b c "Worldwide Sales of Toyota Hybrids Surpass 9 Million Units" (Press release). Toyota, Aichi: Toyota. 2016-05-20. Retrieved 2016-05-22. ^ "Toyota tops 2 million hybrid sales worldwide" (Press release). AutobloGreen. 2009-09-04. Retrieved 2009-10-24. ^ a b "Worldwide Prius Cumulative Sales Top 2M Mark; Toyota Reportedly Plans Two New Prius Variants for the US By End of 2012". Green Car Congress. 2010-10-07. Retrieved 2010-10-07. ^ a b c d e "Worldwide Prius sales top 3-million mark; Prius family sales at 3.4 million". Europe: Green Car Congress. 2013-07-03. Retrieved 2013-07-03. ^ a b "Toyota sells One-Millionth Prius in the US". Green Car Congress. 2011-04-06. Retrieved 2011-04-07. ^ a b c d e f g h i j k l m n o "Worldwide Sales of Toyota Hybrids Surpass 10 Million Units" (Press release). Toyota City, Japan: Toyota. 2017-01-14. Retrieved 2017-01-15. This latest milestone of 10 million units was achieved just nine months after total sales reached 9 million units at the end of April 2016. The Prius family accounts for 61% of Toyota's total global cumulative hybrid car sales: 6.115 million units, consisting of Prius liftback: 3.9846 million; Aqua, Prius c: 1.3801 million; Prius α, Prius v, Prius +: 614,700; and Prius PHV: 79,300. ^ a b Voelcker, John (2016-12-01). "Plug-in electric car sales for Nov: Volt soars, Prius Prime arrives (UPDATE)". Green Car Reports. Retrieved 2016-12-01. ^ a b c Edelstein, Stephen (2016-11-21). "Hyundai Ioniq Electric beats Prius Prime, BMW i3 on energy efficiency". Green Car Reports. Retrieved 2016-11-21. ^ a b "Most Efficient EPA Certified Vehicles". U. S. Environmental Protection Agency and U.S. Department of Energy. 2016-11-16. Retrieved 2016-11-21. The 2014–16 BMW i3 BEV was the most efficient EPA-certified vehicles considering all fuels and of all years until November 2016, when it was surpassed by the 2017 Hyundai Ioniq Electric. As of November 2016[update], the 2016 Toyota Prius Eco hybrid car is most efficient EPA-certified vehicle with a gasoline engine without plug-in capability. ^ "With 8 Million Units Sold, Toyota Proves Hybrids Have Staying Power" (Press release). Toyota, Aichi: Toyota. 2015-08-21. Retrieved 2015-08-23. ^ "Toyota Reveals All-New Prius" (Press release). US: Toyota. 2009-01-12. Retrieved 2016-11-19. ^ "Toyota Prius Family". Toyota Motor Corporation. Retrieved 2011-02-05. ^ Woodyard, Chris (2011-02-20). "Voters decide Toyota Prii is now official plural for Prius". USA Today. Retrieved 2012-02-08. ^ Vieira da Rosa, Aldo. Fundamentals of Renewable Energy Processes. Academic Press, 2012. p.431. ^ Loveday, Eric (2011-09-16). "Toyota revises 2012 Prius with minor tweaks inside and out". AutoblogGreen. Retrieved 2011-09-17. ^ "Toyota Introduces 2012 Prius Plug-in Hybrid" (Press release). Toyota. 2011-09-16. Retrieved 2011-09-17. ^ "Toyota Prius Chronological History". Retrieved 2009-11-06. ^ Taylor, Alex (2006-02-24). "The Birth of the Prius". Fortune. US. Retrieved 2018-03-23. ^ a b Thornton, Emily; Naughton, Keith; Woodruff, David (1997-12-15). "Japan's hybrid cars". BusinessWeek. Archived from the original on 2011-06-28. ^ a b c Prius Model History, Clean Green Car Company. Retrieved 2007-12-19. ^ "Takaoka Plant". Toyota Motor Corporation. 2012. Retrieved 2014-02-14. ^ "The complete history of the Toyota Prius in 89 words". UK: Toyota. 2015-01-22. Retrieved 2015-02-11. ^ 2001 Toyota Prius Lineup Archived 2013-10-29 at the Wayback Machine, Internet Autoguide. Retrieved 2007-12-20. ^ Tsukada, M., Aichi's Artisanship in the Auto Industry Archived 2012-12-19 at Archive.today, Aichi Voice (Cutting Edge). ^ More Toyota Priuses Coming to Australia, Australian Car Advice, 1 March 2007. Retrieved 2007-12-20. ^ "Motomachi Plant". Toyota Motor Corporation. 2012. Retrieved 2014-02-14. ^ a b c Pollack, Andrew (2000-11-19). "Behind the Wheel:Toyota Prius-It's Easier to Be Green". The New York Times. Retrieved 2011-11-30. ^ Russ, C., Toyota Pruis (2001), The Auto Channel. Retrieved 2010-03-09. ^ EPA Green Vehicle Guide. ^ Olszewski, Mitch (March 2011). "Evaluation of the 2010 Toyota Prius Hybrid Synergy Drive System" (PDF). US: Department of Energy. Retrieved 2019-02-24. ^ Motor Trend 2004 Car of the Year Winner: Toyota Prius, Motor Trend. Retrieved 2007-12-21. ^ "Motor Trend 2004 Car of the Year Winner: Toyota Prius". MotorTrend Magazine. Source Interlink Media. Retrieved 2008-05-30. ^ "Innovators: Shigeyuki Hori". Time. 2004-08-03. Retrieved 2010-01-10. ^ "Tsutsumi Plant". Toyota Motor Corporation. 2012. Retrieved 2014-02-14. ^ "Affiliates (Toyota wholly-owned subsidiaries)-Toyota Auto Body Co., Ltd". Toyota Motor Corporation. 2012. Retrieved 2014-02-14. ^ Bowden, R. (2004), 2004 Toyota Prius, About. Retrieved 2007-12-21. ^ Test Drive Notes: 2004 Toyota Prius Archived 2010-12-26 at the Wayback Machine, Car Talk. Retrieved 2007-12-21. ^ "Prius Battery Change is No Big Deal" (Press release). US: Toyota. 2008-12-29. Archived from the original on 2012-09-06. Retrieved 2012-08-27. ^ "Prius 2011 Warranty & Maintenance Guide" (PDF). US: Toyota. Archived from the original (PDF) on 2011-07-17. Retrieved 2011-03-04. ^ "Toyota Prius Warranty and Coverage". Toyota. Retrieved 2011-03-04. ^ "Toyota Delays Production of Third Generation Prius in China". ChinaAutoWeb.com. ^ Rowley, Ian (2007-11-05). "Prius sales yet to catch fire in China". BusinessWeek Eye on Asia blog. Retrieved 2010-06-05. ^ "In China, Toyota cuts price of Prius by 8% due to slowing sales". AutoblogGreen. 2008-03-07. Retrieved 2010-04-28. ^ "2010 Toyota Prius Revealed – Specs, Images, and more". Automoblog.net. Retrieved 2010-10-03. ^ Kageyama, Associated Press, Yuri (2009-05-18). "Toyota rolls out new Prius amid hybrid price war". San Francisco Chronicle. Archived from the original on 2009-05-27. Retrieved 2009-05-21. ^ Greimel, Hans (2010-02-23). "Toyota Prius slashes price to match Honda Insight". AutoWeek. Retrieved 2010-03-23. ^ Ueno, Kiyori; Komatsu, Tetsuya (2010-01-08). "Toyota Prius Leaps to No. 1 in Japan on Incentives". Bloomberg. Retrieved 2010-03-07. ^ Thomas, David (2009-03-25). "Our view: 2010 Toyota Prius". Cars. US. Retrieved 2018-12-31. ^ Wood, Colum (2009-06-26). "2010 Toyota Prius Hybrid Review". AutoGuide. US. Retrieved 2019-01-01. ^ "Sweating the Body Details". Vehicle Electrification. SAE International. 2010-11-01. p. 39. Retrieved 2011-05-16. ^ Sherman, Don (2014-06-01). "Drag Queens: Aerodynamics Compared". Car & Driver. Retrieved 2014-07-02. ^ "Third-generation 2010 Prius adds new front-drive platform". Autofile. Archived from the original on 2015-12-10. Retrieved 2015-11-05. ^ "Goauto.com.au". Go auto. 2009-04-14. Retrieved 2010-10-03. ^ "Consumer Reports Names Toyota Prius Best New-Car Value for Second Year in A Row'". Consumer Reports. 2013-12-18. Archived from the original on 2013-12-25. Retrieved 2014-12-04. ^ Chavanne, Julie. "Cars Original Owners Keep for 15 Years or Longer". Retrieved February 14, 2019. ^ "Beyond Possible: The Sky's the Limit for the All-New 2016 Prius at Las Vegas World Premiere Event" (Press release). US: Toyota. 2015-09-09. Retrieved 2015-12-27. ^ Muller, Joann (2013-08-29). "Toyota Unveils Plans For 15 New Or Improved Hybrids (It Already Has 23)". Forbes. Retrieved 2013-08-31. ^ Trudell, Craig; Ohnsman, Alan (2013-08-28). "Toyota Refines Battery Chemistry to Boost Next Prius Efficiency". Bloomberg Businessweek. Retrieved 2013-08-31. ^ Rechtin, Mark (2013-08-28). "Next Prius will cost less, get better fuel economy, Toyota engineer says". Automotive News. Retrieved 2013-08-31. ^ "Toyota broadly outlines next-generation Prius; developing wireless inductive charging for the plug-in model; bullish on hydrogen". US: Green Car Congress. 2013-08-28. Retrieved 2013-08-31. ^ Golson, Daniel (2018-11-08). "The 2019 Toyota Prius Is Likely Getting All-Wheel Drive". Car and Driver. US. Retrieved 2018-11-09. ^ "2019 Toyota Prius gets a facelift and all-wheel drive". 2018-11-27. Retrieved 2018-11-27. ^ "Toyota Prius Plug-in Hybrid Demo Program". Toyota. Retrieved 2010-04-09. ^ "TMC Introduces 'Prius Plug-in Hybrid' into Key Markets". Toyota News release. 2009-12-14. Retrieved 2010-04-09. ^ "Toyota to Start Trials of Plug-in Prius in China". Green Car Congress. 2010-04-25. Retrieved 2010-04-26. ^ Munday, Stephen (2011-09-30). "Prius Plug-In Hybrid on Sale January in Japan – Charging Stations at 5,500 Dealerships and Car Rental Locations". Integrity Exports. Retrieved 2011-09-30. ^ Voelcker, John (2012-04-03). "Plug-In Car Sales Soar in March, Led By Chevrolet Volt". Green Car Reports. Retrieved 2012-04-03. ^ a b "Solid 13% Q2 sales increase for Toyota and Lexus vehicles in Europe" (Press release). Europe: Toyota. 2012-07-13. Archived from the original on 2013-02-13. Retrieved 2012-08-07. ^ Evans, Huw (2012-08-07). "Toyota Delivers First Fleet Customer Prius Plug-In". HybridCars.com. Archived from the original on 2012-08-10. Retrieved 2012-08-07. ^ Philip, Siddharth (2013-03-12). "GM's Chevy Volt Outsold Nissan Leaf Last Year, BNEF Says". Bloomberg L.P. Retrieved 2013-03-30. ^ Berman, Brad (2015-05-01). "Toyota Halts Production of Prius Plug-in Hybrid Until Late 2016". Plugincars.com. Retrieved 2015-06-20. ^ a b Tajitsu, Naomi (2017-02-15). "Toyota sees plug-in hybrids catching on faster than conventional hybrids". Reuters. Automotive News. Retrieved 2017-02-19. Around 75,000 first generation Prius plug-ins have been sold since its launch in 2012. ^ a b Undercoffler, David (2016-02-01). "Toyota's fuel-thrifty Prius family may shrink as automaker ponders strategy". Automotive News. Retrieved 2016-03-25. Prius PHV sales totaled 42,293 units through December 2015. ^ a b "Monthly Plug-In Sales Scorecard". InsideEVs.com. Retrieved 2017-02-19. See annual sales in 2016. First generation Prius Plug-in Hybrid sales totaled 52 units in 2016 through September, when dealerships run out of stock. Deliveries of the second generation Prius Prime began in November 2016. A total of 3,788 Prius Prime cars have been sold between November 2016 and January 2017. ^ Cobb, Jeff (2017-01-31). "Tesla Model S Is World's Best-Selling Plug-in Car For Second Year In A Row". HybridCars.com. Retrieved 2017-02-19. See detailed 2016 sales and cumulative global sales in the two graphs. ^ Kageyama, Yuri (2016-06-17). "Toyota gets bullish on plug-in hybrids with new Prius Prime". Japan Today. Retrieved 2016-06-17. ^ a b c Blanco, Sebastian (2016-03-23). "Toyota Prius Prime plugs in with 22 EV miles". Autoblog.com. Retrieved 2016-03-24. ^ a b Undercoffler, David (2016-03-23). "Toyota looks to boost Prius with all-new plug-in Prime". Automotive News. Retrieved 2016-03-24. ^ a b LeSage, Jon (2016-10-05). "2017 Prius Prime Offers Industry's Best 'MPGe' and 25 Miles Electric Range". HybridCars.com. Retrieved 2016-10-15. ^ Halvorson, Bengt (2016-03-24). "2016 Toyota Prius Prime: details on 120 MPGe plug-in hybrid, all-electric mode". Green Car Reports. Retrieved 2016-03-24. ^ a b Kim, Chang-Ran (2011-05-13). "UPDATE 1-Toyota gets 25,000 pre-sale orders for Prius Alpha in Japan". Reuters. Retrieved 2011-05-13. ^ "Toyota launches Prius α in Japan; forecasts delay in deliveries of the new model". Green Car Congress. 2011-05-13. Retrieved 2011-05-13. ^ Motavalli, Jim (2011-03-10). "Toyota Downsizes Prius Wagon's Seating Capacity for U.S." The New York Times. Retrieved 2011-03-15. ^ Mukai, Anna; Hagiwara, Yuki (2011-12-25). "Toyota Adds to Prius Lineup With Smallest Hybrid". Bloomberg L.P. Retrieved 2011-12-28. ^ Nordlicht, Donny (2012-03-12). "Make It Yours: 2012 Toyota Prius c Configurator Goes Live". Motor Trend. Retrieved 2012-03-12. ^ "New models and hybrids power Toyota Canada Inc.'s sales in March 2012" (Press release). Canada: Toyota. 2012-04-03. Retrieved 2012-05-01. ^ Stevens, Mike (2012-03-27). "Toyota Prius C on Sale in Australia". The Motor Report. Retrieved 2012-05-22. ^ Sloane, Alastair (2012-03-17). "Toyota on hybrid recruitment drive with baby Prius". The New Zealand Herald. Retrieved 2012-03-17. ^ Crowe, Philippe (2012-06-25). "France-Sourced Toyota Yaris US-Bound in 2013". HybridCars.com. Archived from the original on 2012-06-28. Retrieved 2012-07-31. ^ Masson, Laurent J. (2012-01-16). "The Toyota Yaris hybrid, one for Europe". Motor Nature. Retrieved 2012-02-11. ^ a b c d 新車乗用車販売台数ランキング [New passenger car sales ranking] (in Japanese). Japan Automobile Manufacturers Association. Retrieved 2013-03-30. See total sales from January to December. Toyota is reporting in Japan sales of the regular Prius and Prius α together. ^ "2012 (Full Year) Japan: Best-Selling Car Models". BestSellingCars.com. 2013-01-10. Retrieved 2013-03-30. ^ 2月のボディタイプ別売れ筋モデルをチェック [Check the best selling models of different body types February 2012] (in Japanese). Car View. Retrieved 2013-03-30. When sales are broken down by model, the Aqua ranked second in January and first in February 2012. ^ "Japan Full Year 2012: Now with Top 375 All-models ranking!". Best Selling Cars Blog. 2013-02-13. Retrieved 2013-03-30. ^ a b Bekker, Henk (2015-01-08). "2014 (Full Year) Japan: Best-Selling Car Models". Best Selling Cars. Retrieved 2015-01-23. ^ a b Ohnsman, Alan (2014-01-09). "Nissan set to double Leaf sales: Ghosn". Japan Times. Retrieved 2014-01-25. ^ Bekker, Henk (2016-01-08). "2015 (Full Year) Japan: : 30 Best-Selling Car Models". Best Selling Cars. Retrieved 2016-06-05. ^ Gasnier, Mat (2013-01-12). "Japan Full Year 2012: All-new Toyota Aqua tickles Prius". Best Selling Cars Blog. Retrieved 2013-03-30. ^ a b c d e f Cobb, Jeff (2013-01-08). "December 2012 Dashboard". HybridCars.com and Baum & Associates. Retrieved 2013-04-14. See the section: December 2012 Hybrid Car Sales Numbers. ^ 新車乗用車販売台数ランキング [New passenger car sales ranking] (in Japanese). Japan Automobile Manufacturers Association. Retrieved 2013-09-07. Select Year 2013 and see total sales from January to August. Toyota is reporting in Japan sales of the regular Prius and Prius α together. ^ Cobb, Jeff (2013-08-05). "August 2013 Dashboard". HybridCars.com and Baum & Associates. Retrieved 2013-08-05. See the section: U.S. Hybrid sales for August 2013: A total of 29,850 units had been sold between January and August 2013. ^ "Hybrid Model Global Sales Results" (Press release). Toyota, Aichi: Toyota. 2015-08-21. Retrieved 2015-08-23. ^ "Worldwide Prius Sales Top 1 Million" (Press release). Toyota Motor Corporation. 2008-05-15. Archived from the original on 2010-02-10. Retrieved 2010-03-22. ^ "Toyota Reports December And 2009 Sales". Toyota. Archived from the original on 2012-02-22. Retrieved 2010-01-05. ^ Cobb, Jeff (2016-06-06). "Americans Buy Their Four-Millionth Hybrid Car". HybridCars.com. Retrieved 2017-02-17. ^ "Toyota Prius Sales in Europe Reach 200,000 Units". Green Car Congress. 2010-07-16. Retrieved 2010-07-16. ^ "Prius No. 1 in Japan sales as green interest grows". USA Today. Associated Press. 2010-01-08. Retrieved 2010-03-14. ^ "Hybrids Now 16% of Market in Japan as Prius Wins Annual Sales Crown Again". Asahi Shimbun. Integrity Exports. 2012-04-06. Retrieved 2012-04-08. ^ "Aqua Tops Prius as Best-Selling Car in Japan". Product Design and Development (PDDnet). Associated Press. 2012-10-06. Retrieved 2012-11-10. ^ Gasnier, Mat (2012-11-06). "Japan October 2012: Toyota Aqua takes the lead, 86 up to # 14". Best Selling Cars Blog. Retrieved 2012-11-10. ^ "2012 (Full Year) Japan: Best-Selling Car Models". BestSellingCars.com. 2013-01-10. Retrieved 2013-01-16. ^ 2月のボディタイプ別売れ筋モデルをチェック [Check the best selling models of different body types February 2012] (in Japanese). Car View. Retrieved 2012-10-22. When sales are broken down by model, the Aqua ranked second in January and first in February 2012. ^ "Japan by version December 2012: Nissan Sylphy & Subaru BRZ up". Best Selling Cars Blog. 2013-09-29. Retrieved 2013-01-29. ^ "Liftback accounts for 63% of March Prius sales; Prius v and c account for about 17% each". Green Car Congress. 2012-04-08. Archived from the original on 2012-04-08. Retrieved 2012-04-08. ^ "March 2012 Dashboard". HybridCars.com. 2012-04-08. Archived from the original on 2012-04-07. Retrieved 2012-04-06. ^ Ohnsman, Alan (2012-04-03). "Toyota Sets Prius Sales Record on Bigger Lineup, Gas Prices". Bloomberg News. Retrieved 2012-04-08. ^ Hirsch, Jerry (2013-01-22). "Toyota Prius topples Honda Civic as bestselling car in California". Los Angeles Times. Retrieved 2013-01-22. The sales figure includes the Prius liftback, Prius v, Prius c and Prius PHV. ^ "Toyota Prius keeps Calif. sales crown; Tesla moves up". Automotive News. Bloomberg L.P. 2014-02-13. Retrieved 2014-02-16. ^ "California Auto Outlook: Fourth Quarter 2013". California New Car Dealers Association (CNCDA). February 2014. Archived from the original on 2014-02-17. Retrieved 2014-02-16. ^ Voelcker, John (2013-01-03). "Plug-In Electric Car Sales Triple in 2012 As Buyers, Models Increase". Green Car Reports. Retrieved 2013-01-17. ^ Blanco, Sebastian (2012-11-28). "Toyota's Jim Lentz looks into the future of wireless charging, CNG and more hydrogen". Autoblog Green. Retrieved 2012-11-28. ^ "2014 Toyota Prius Continues to Dominate the Hybrid Category" (Press release). US: Toyota. 2013-10-16. Retrieved 2013-10-26. ^ "December 2011 Dashboard: Sales Still Climbing". HybridCARS.com. 2012-01-09. Archived from the original on 2012-01-12. Retrieved 2012-01-10. ^ Cobb, Jeff (2013-10-03). "September 2013 Dashboard". HybridCars.com and Baum & Associates. Retrieved 2013-10-26. See the section: September 2013 Hybrid Car Sales Numbers: A total of 389,910 hybrid vehicles were sold in the US between January and September 2013. ^ "Japan March 2012: Toyota Prius, Aqua & Honda Fit all beat records". Best Selling Cars Blog. 2012-04-06. Retrieved 2012-04-08. ^ "Passenger car sales ranking" (in Japanese). Japan Automobile Manufacturers Association. Retrieved 2012-04-08. ^ Rall, Patrick (2012-05-30). "Toyota Prius becomes 3rd bestselling nameplate in the world". Torque News. Retrieved 2012-08-05. ^ Cheong, Hans (2012-05-30). "Corolla World's Top Selling Nameplate, Focus World's Best Selling Model". New Sunday Times. Archived from the original on 2013-10-26. Retrieved 2012-08-05. ^ a b c d e "実績データ（ハイブリッド車グローバル販売）" [Actual data (global sales hybrid vehicles)] (Press release) (in Japanese). Toyota, Aichi: Toyota. 2016-05-20. Retrieved 2016-05-29. ^ Cain, Timothy (May 2016). "Toyota Prius Sales Figures - Canada". Good Car Bad Car. Retrieved 2016-05-29. ^ Cobb, Jeff (2014-01-06). "December 2013 Dashboard". HybridCars.com and Baum & Associates. Retrieved 2014-05-03. ^ Cobb, Jeff (2015-01-06). "December 2014 Dashboard". HybridCars.com and Baum & Associates. Retrieved 2015-08-25. ^ Cobb, Jeff (2016-01-06). "December 2015 Dashboard". HybridCars and Baum & Associates. Retrieved 2016-05-23. ^ "December 2016 Dashboard". HybridCars.com. Retrieved 2016-08-12. ^ "Toyota Motor Europe (TME) sold 928,500 vehicles in 2016 with best-ever sales for Hybrids and Lexus" (Press release). Europe: Toyota. 2017-01-06. Retrieved 2018-02-11. ^ "December 2017 Dashboard". HybridCars.com. Retrieved 2016-02-09. ^ "2017 Toyota Motor Europe (TME) sales reach the 1 million mark with over 40% Hybrid EV sales" (Press release). Europe: Toyota. 2018-01-10. Retrieved 2018-02-11. ^ "December 2018 Sales Chart" (Press release). USA: Toyota. 2019-01-03. Retrieved 2019-01-05. ^ a b c "実績データ（ハイブリッド車グローバル販売）" [Actual data (global sales hybrid vehicles)] (Press release) (in Japanese). Toyota, Aichi: Toyota. 2017-02-14. Retrieved 2017-02-21. Download the pdf file with sales by year for each model. Source for 2016 sales only. January 2017 sales were discounted from total. ^ Millikin, Mike (2016-05-20). "Worldwide sales of Toyota hybrids surpass 9 million units; Prius family accounts for 63%". Green Car Congress. Retrieved 2016-05-22. The Prius family accounts for 63% of Toyota's total global cumulative hybrid car sales: 5.691 million units, consisting of Prius liftback: 3.733 million; Aqua, Prius c: 1.249 million; Prius a, Prius v, Prius +: 0.634 million; Prius PHV: 75,000. ^ "Toyota Motor Europe Posts 13% Sales Increase in Q3" (Press release). Europe: Toyota. 2012-10-09. Archived from the original on 2013-02-13. Retrieved 2012-10-21. ^ "Toyota Specs". Toyota.com. Archived from the original on 2009-05-03. Retrieved 2012-06-01. ^ "Our Point of View: Atkinson Meets Otto: Why the Prius is So Efficient" (Press release). US: Toyota. 2008-09-08. Archived from the original on 2017-09-28. Retrieved 2012-01-02. ^ "Motor Trend 2004 Car of the Year Winner: Toyota Prius". Motor Trend. ^ Gordon-Bloomfield, Nikki (2011-08-02). "Buying A Used Toyota Prius? Here's What You Need To Know". Green Car Reports. ^ Ireson, Nelson (2009-03-25). "First drive: 2010 Toyota Prius". Motor Authority. ^ "Prius 2011" (PDF). US: Toyota. 2010. Retrieved 2018-12-30. ^ "MY18 Prius eBrochure" (PDF). US: Toyota. 2017. Retrieved 2018-12-30. ^ Harley, Michael (2016-12-19). "2017 Toyota Prius: Captivating Enough To Engage A Car Guy?". Forbes. ^ Voelcker, John (2009-03-29). "30 Days of the 2010 Toyota Prius: Day 5, The 10 Best Things". Green Car Reports. ^ Berman, Brad (2009-11-12). "Top 7 Aftermarket MPG-Boosting Prius Accessories". HybridCars. ^ "Toyota Prius II Battery Pack". The Clean Green Car Company. Archived from the original on 2008-02-25. Retrieved 2008-05-30. ^ Gorman, Steve (2009-08-31). "As hybrid cars gobble rare metals, shortage looms". Reuters. Retrieved 2011-04-17. ^ "Battery Module NP2". Primearth EV Energy Co., Ltd. Retrieved 2015-07-12. ^ a b Fisher, Jake (2011-02-16). "The 200,000-mile question: How does the Toyota Prius hold up?". Consumer Reports. Archived from the original on 2011-02-20. Retrieved 2011-02-26. ^ Leijen, Peter; Scott, Jonathan. "Failure analysis of some Toyota Prius battery packs and potential for recovery". Waikato University Research Commons. Retrieved 2011-11-27. ^ Van Batenburg, Craig (2009-04-01). "Hybrid A/C Repair" (PDF). ToolingUp. Retrieved 2009-04-01. ^ Mavrigian, Mike (2013-04-10). "Hybrid vehicle air conditioning service". Auto Service Professional. Retrieved 2013-04-10. ^ a b "Fueleconomy.gov Top Ten - Top Fuel Sippers (EPA Ratings, All Years)". US Environmental Protection Agency and US Department of Energy. 2016-03-24. Retrieved 2016-03-24. Click on the link "Top Fuel Sippers (EPA Ratings, All Years)" Excludes all-electric vehicles. ^ "EPA reveals top 10 most fuel-efficient cars since 1984, original Honda Insight takes top honors". Autoblog.com. 2010-06-11. Retrieved 2012-04-09. ^ Woodyard, Chris; Healey, James R. (2009-01-14). "Auto Show Notebook: New Prius gets 50 mpg". USA Today. Retrieved 2012-04-09. ^ Bailey, David; Krolicki, Kevin (2012-04-10). "Chevy Volt tops Prius in fuel economy rating". Reuters. Retrieved 2012-04-08. ^ "2012 Most and Least Efficient Vehicles". US Department of Energy and US Environmental Protection Agency. April 2010. Retrieved 2012-04-08. Click on the tab "Cars (excluding EVs)". ^ Does hybrid car production waste offset hybrid benefits? ^ a b "Prius Plug-In eligibile for a $1,500 California consumer incentive plus $2,500 Federal tax credit". US: Green Car Congress. 2012-02-28. Retrieved 2012-04-08. ^ "Prius Certified to Japanese 2015 Fuel Economy Standards with JC08 Test Cycle". Green Car Congress. 2007-08-11. Retrieved 2012-04-09. 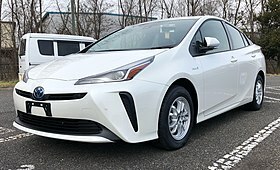 ^ "TOYOTA、プリウスが「2015年度燃費基準」を達成" [TOYOTA, the Prius achieve "fiscal 2015 fuel economy standards"] (in Japanese). Japan: Toyota. 2007-08-10. Retrieved 2012-04-10. ^ Abuelsamid, Sam (2009-04-03). "Japanese ratings call Prius world's most efficient car, 89.4 mpg (US)!". Autoblog Green. Retrieved 2012-04-10. ^ Loveday, Eric (2011-05-13). "Toyota Prius Alpha launches in Japan; delivery delays expected". Autoblog Green. Retrieved 2012-04-10. See details in TMC press release. ^ "Toyota launches Aqua compact hybrid in Japan; targeting 12,000 units per month in sales". Green Car Congress. 2011-12-26. Retrieved 2012-04-10. ^ "Toyota starts taking orders for soon-to-be-launched Prius PHV plug-in hybrid in Japan; targeting 35,000-40,000 units per year". Green Car Congress. 2011-11-29. Retrieved 2012-04-10. ^ English, Andrew (2008-10-11). "Toyota Prius - green winner or loser?". The Daily Telegraph. London. Retrieved 2008-10-11. ^ "Sustainability Report 2010" (PDF). Toyota Motor Corporation. 2010. ^ "GCDA Annual report and accounts 2009–2010 (see page 15)" (PDF). Government Car and Despatch Agency. 2010. Archived from the original (PDF) on 2011-02-03. ^ "Dust to Dust" (PDF). CNW Marketing Research. 2006. Archived from the original (PDF) on 2007-06-26. ^ Gleick, Peter H. (2007). "Hummer versus Prius: 'Dust to Dust' Report Misleads the Media and Public with Bad Science" (PDF). pacinst.org. ^ a b Motavalli, Jim (2008-04-27). "Fear, but Few Facts, on Hybrid Risk". The New York Times. ^ "Measurement and Analysis of Electromagnetic Fields from Trams, Trains and Hybrid Cars". Rpd.oxfordjournals.org. 2010-06-16. Retrieved 2012-06-01. ^ "Mythbuster: EMF levels in hybrids" (Press release). ConsumerReports.org. 2010-08-04. Archived from the original on 2010-11-09. Retrieved 2011-01-26. ^ King, Danny (2013-03-01). "Relax, electric-drive vehicles play nice with pacemakers, defibrillators". Autoblog Green. Retrieved 2013-03-20. See more details in the Press Release. ^ flandez, Raymund (2007-02-13). "Blind Pedestrians Say Quiet Hybrids Pose Safety Threat". The Wall Street Journal. ^ "National Federation of the Blind 2006 Resolutions". The Braille Monitor. August–September 2003. ^ Youso, Karen (2007-07-20). "Fixit: Will quiet hybrids get noisier?". StarTribune.com (Star Tribune, Minneapolis MN). Archived from the original on 2007-10-17. ^ "TMC to Sell Approaching Vehicle Audible System for 'Prius'". Toyota Motor Company News Release. 2010-08-24. Retrieved 2010-08-25. Click this link for a video showing a demo of the warning sound at different speeds. ^ "TMC to Sell Approaching Vehicle Audible System for 'Prius'". Toyota Motor Company News Release. 2010-08-24. Retrieved 2010-08-25. ^ "Critical Pedestrian Safety Legislation Moves to White House for President's Signature" (Press release). American Council of the Blind. PR Newswire. 2010-12-16. Retrieved 2010-12-17. ^ Goodwin, Antuan (2011-09-22). "Prius' artificial engine noise demonstrated, explained". CNET Cartech. Retrieved 2011-09-25. ^ Gordon-Bloomfield, Nikki (2011-09-23). "2012 Toyota Prius, Prius V, Prius Plug-in Hybrid: Now With Spaceship Sound". Electric Car Reports. Retrieved 2011-09-25. ^ Nelson, Gabe (2013-03-01). "Louder EVs may turn off drivers, automakers say". Automotive News. Retrieved 2013-03-20. ^ "ASA Adjudication: Toyota (GB) plc". UK Advertising Standards Authority. 2007-06-06. Archived from the original on 2007-08-12. ^ "Half Gas, Half Electric, Total California Cool: Hollywood Gets a Charge Out of Hybrid Cars". The Washington Post, page C01, via washingtonpost.com, 2002-06-06. Retrieved 2007-08-13. ^ Anderson, Kevin. "Hybrid cars take hold in US". BBC News, 2005-02-22. Retrieved 2007-08-13. ^ Haddock, Vicki. "Oh, so pious, Prius drivers: Smugness drifts over the warming Earth -- is that a bad thing?" San Francisco Chronicle, page D-3, via sfgate.com, 2007-07-15. Retrieved 2007-08-13. ^ Maynard, Micheline; Nick Bunkley and Mary M. Chapman contributing. "Say 'Hybrid' and Many People will Hear 'Prius.'" The New York Times, 2007-07-04. Retrieved 2007-08-13. ^ Samuelson, Robert J. "Prius Politics". The Washington Post, page A15, via washingtonpost.com, 2007-07-25. Retrieved 2007-08-13. ^ Herrick, Ember (2003-01-06). "'What would Jesus drive?' stirs religious coals". Universe, Brigham Young University. Archived from the original on 2010-03-27. Retrieved 2010-08-04. ^ "James Woolsey - Interview". Motor Trend. Retrieved 2012-06-01. ^ Belfiore, Michael (2007-11-04). "Carnegie Takes First in DARPA's Urban Challenge". Wired. ^ "Meet the World's fastest Toyota Prius" (Press release). UK: Toyota. 2016-04-07. Retrieved 2018-05-27. ^ Knapp Schilke, Nancy (2012-09-12). "Joao Paulo de Oliveira clinches first career Super GT pole at Fuji". Motorsport.com. Retrieved 2013-04-29. ^ a b c d Berman, Brad (2011-05-11). "Corporate Incentives for Hybrids and Alternative Cars". Retrieved 2016-03-20. ^ "Q&A with Google's VP of Marketing". Bloomberg. 2007-08-06. Archived from the original on 2007-10-16. ^ "Details of Hyperion Solutions' Drive Clean Program". Hyperion Solutions. November 2004. Retrieved 2007-01-12. ^ "Cool Mayors for Climate Protection - Global Warming: More Than the Environment". US: Cool Mayors. Archived from the original on 2007-07-04. ^ "MIA received hybrid cars for the new patrol police from the Japanese government" (Press release). Ukraine: Ministry of Internal Affairs. 2015-06-07. Archived from the original on 2015-10-18. Retrieved 2015-09-03. Wikimedia Commons has media related to Toyota Prius.